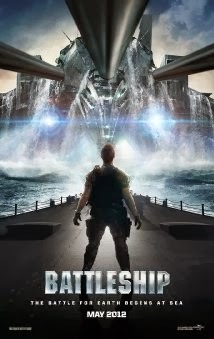 In Battleship, we see how the fleet of the Navy has to compete against aliens who set foot on earth. Trapped in an alien force field of more than 480 kilometers, five ships and five alien ships have to battle each other without any form of communication. I really didn’t have high expectations when I started watching “Battleship“, and yet I had a great time with this action packed SF. Ultimately, this movie shows what they initially made it ​​for: awful lot of action and stupid violence, heroism of the highest order and sometimes a bit of humor. Despite the length of the movie , I didn’t get bored and it wasn’t as usual a battle against sleep. Granted, you should not expect too much of the storyline or look for any depth in the story. The story on its own isn’t logical either. But that can’t spoil the fun, and you can expect some blasting action scenes. About the performances we can be brief : there weren’t any because that was totally unnecessary and there was no need to bring up profound characters . It was a hodgepodge of cliché personalities as we have seen already in multiple movies. First you have the Hopper brothers. Stone is the caring and perfect soldier (Alexander Skarsgard) who has a neatly controlled life and knows his responsibilities and tries to explain that to the rebellious profligate brother Alex (Taylor Kitch). When they are celebrating Alex his birthday in a dark bar, purely by coincidence the Admiral his daughter Sam (Brooklyn Decker) walks in there for a “Chicken Buritto”. Her well formed shapes make Alex his hormones go totally flabbergasted. The result is a ridiculous intrusion as we have already seen a lot on You Tube . Before you know it , he is also in the navy and promoted at a very short notice to Lieutenant. The Admiral himself is played by Liam Neeson. He’s just for a little time in the picture and probably has accepted this role for filling up a hole in his busy schedule. Rihanna played a female macho. To be honest, I didn’t recognize her at all, and oddly enough she didn’t bother me. A starring role for me was the interpretation by Gregory D. Dadson of the veteran Canales, because it was so spontaneous and eventually was the funniest part. The moment when the alien stared at his two prosthetics was priceless. Most useless (but necessary) contribution was the gang of “Benidorm Bastards” that eventually took care of things. About the images I was pretty satisfied. It had a “Pacific Rim” feeling. The special effects were sometimes hugely impressive. The alien spacecrafts were realistic and looked ominously threatening. Huge monstrous vehicles which moved with tremendous force on the ocean. The look of the naval fleet was sometimes really amateurish. The naval battles gave me a “Pearl Harbour” feeling. Only the latter movie was better in terms of effects. The moment the destroyer started to sink and Alex and the Japanese captain Nagata stood at the stern, the comparison with “Titanic” wasn’t far off. Sometimes the shots seemed to be made ​​in a bathtub with Dinkey Toys toys. The aliens did their best to act aggressively. But it was nevertheless quite ridiculously when they were confronted with a human and turned into a friendly E.T. The reason why those aliens came to earth is not entirely clear. To me it seemed like it was for them to test whether they could set up a communication line with their home planet. And every time I wonder why humanity always seeks contact with a life form that is light years from here. If they are out there, you can nevertheless assume that if this race can come over here, they have outclassed our technology in all areas. Well it’s nice that Cal Zapata reminds us twice that when an alien race reacts to the signal and makes contact, this would be like when Columbus discovered the Indians. Except that we are now the Indians. Oh well, the final result was something like “Top Gun“. Again a demonstration of the American superiority in the Military field. And then we also get to see some retired sailors who manage to get a museum piece to work again. And luckily there’s even ammunition on board to use. These triggerfinger-grandfathers shoot those aliens back into space so there is a peaceful ending and Alex can ask the Admiral for permission to marry his daughter. That this was going to happen was obvious. But it was still enjoyable to watch this entertaining spectacle (with an empty head). Sometimes it’s just that plain simple.